Kevin Spacey (21), Ewan McGregor (Deception) and Jeff Bridges (Iron Man) have joined George Clooney (Leatherheads) among the cast of Men Who Stare At Goats, the feature length directing debut for Clooney’s buddy Grant Heslov (screenwriter of Good Night, And Good Luck). 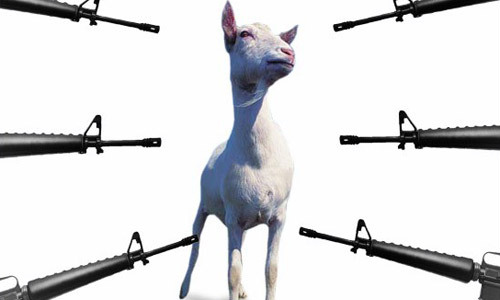 Contrarily to some reports, Men Who Stare At Goats is NOT based on a true story, rather it is inspired by a non-fiction book by Welsh journalist/documentarian Jon Ronson (Stanley Kubrick’s Boxes) exploring paranormal military programs and psychological techniques used for interrogation. The title is a reference to attempts to kill goats by simply staring at them. McGregor will play Bob Wilton, a journalist who meets Clooney’s character Lyn Cassady, a soldier with supernatural powers. Together they go to Iraq and meet up with Cassady’s boss Bill Django, played by Bridges, and Larry Hooper, a supernatural prison warden portrayed by Spacey. Men Who Stare At Goats will be released in 2010. This entry was posted in American Films and tagged 21, Deception, Ewan McGregor, George Clooney, Good Night And Good Luck, Grant Heslov, Iraq, Iron Man, Jeff Bridges, Jon Ronson, Kevin Spacey, Leatherheads, Men Who Stare At Goats, Stanley Kubrick's Boxes, Wales by Mr Hollywood. Bookmark the permalink.